iris company has (ReadIRIS, IRISPen en CardIRIS) and Technology offer OCR (Optical Character Recognition), Intelligent Document Recognition and Document Management solutions to professional and private users. I.R.I.S. is international market leader in these domains. Its Customers include mainly banks, insurance companies, multinationals, Belgian and European institutions, etc. They offer customers solutions in: scanning, Intelligent Document Recognition, electronic document and archives management, and workflow. Readiris is the best solution for home and professional users. Save an incredible amount of time when converting any pa-per, PDF and image documents into digital files you can edit, share and save!and many more. 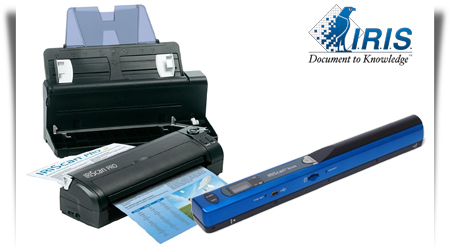 Manually set the time interval between scans to greatly simplify the scanning process for multi-page documents on a flatbed scanner. Readiris™ Pro opens the most common used images (JPEG, BMP, TIFF, etc.) and PDF files. It supports the compression formats DjVu and JPEG 2000 and easily handles multipage documents such as TIFF or PDF file. The new Microsoft format SpreadsheetM is sup-ported. Based on XML, it generates richer editing and formatting of Excel files optimized for Win-dows Office 2003. Your tables are perfectly reproduced in Excel 2003, retaining the text and the colored background. Readiris™ Pro converts your incoming faxes, letters, or any paper documents into fully searchable PDF files at blazing speed! Share or archive your PDF files in up to 4 different types of PDF outputs: Image over Text, Text over Image, Text only, Image only. Turn your PDF files into Word, Excel or any of the supported output format! 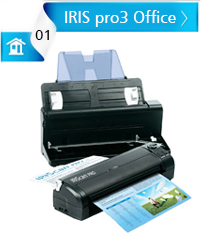 Digitize your handprinted notes thanks to I.R.I.S.’s latest technology. Simply follow the provided instructions and take advantage of this unique feature! Automatic recognition of 23 different types of barcodes, even 2-D barcodes!The information contained in your barcode is au-tomatically retyped into your application. Readiris™ Pro logical interface is the easiest to use of any OCR software on the market. 21 inter-face languages allow users to interact with the application in their own language. The new OCR engine of Readiris™ Pro is optimized for speed and accuracy. The I.R.I.S. powerful Autoformat™ technology re-tains color backgrounds, texts and underlines. An improved formatting of columned documents retains the original lay-out perfectly. Automatically send the recognized document into your favorite application such as: Word, Excel, Acrobat (PDF), Internet Explorer (HTML), Microsoft’s new WordML and SpreadsheetML or save it as an external file. 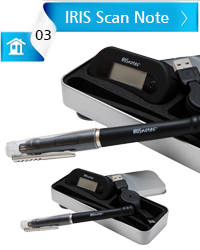 Smart tools for easier use! Contracts, invoices, receipts, bills, and even handwritten correspondence can be scanned in a single click at a very high speed (15ppm). 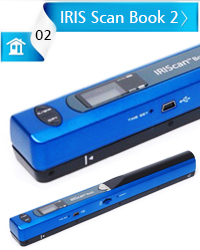 IRIScan™ Book 2 is a portable scanner that allows you to scan books and magazines anytime, anywhere and without ripping pages off..